After the day’s proceedings, – my trial now bizarrely adjourned (again) to March 7th – I fell ill with food poisoning and had to be ushered into a taxi (my high heels thankfully not ruined). A sickly night followed and I’m still not 100%. That’ll teach me not to eat fresh Shetland mussels (one of which clearly wasn’t that fresh) the night before a court hearing. The next morning, I awoke to a 30-day Facebook ban (for publishing a fake news post, clearly tagged as #fakenews) and 60 emails from YouTube informing that my entire library was now subject to sandboxing restrictions. My channel still exists, but no longer appears in searches either on Google or on YouTube. In any case, over half my videos are banned in the UK in order to comply with some non-existent local law. Clearly, my accusers and their team of trusted flaggers have been very busy. Still, 4.5k views on Facebook of my little Christmas ditty won’t please them. Asides all the mainstream coverage, there have been several alternative media broadcasts. Two of The Fetch’s recent Inside the Eye Live! shows have featured segments on my case, including last Thursday’s Oy Vey Moment (worth a listen just for the jingle – from about 34 minutes in). Dennis’ second show features an interview with Ross who came to support me last Wednesday, also well worth a listen, from about 80 minutes in. Ditto regards last night’s Radio Aryan edition of The Daily Nationalist with Sven Longshanks and Jez Turner. This coming Thursday, you’ll be able to hear me in conversation with Andrew Carrington Hitchcock on Euro Folk Radio (recorded a few days before last week’s court appearance but a great show nonetheless) and next Monday, I’ll be the featured guest on the Graham Hart show when, if all goes well, you’ll be able to hear one or two of my songs. Once again, HUGE thanks to those who came in support last Wednesday. As the title of this piece confirms – my trial is not about me, it’s about us all. See you March 7th, same time same place. If you would like to support Alison, please see the right-hand sidebar where you will find links to PayPal and BitCoin. Comments, likes and shares are of course also welcome. You can also find Alison on Gab, and on her new Facebook backup account. Jez Turner – organiser of the London Forum – has been charged with “inciting racial hatred” in connection with his speech at the “Anti-Shomrim” rally in Whitehall on 4th July 2015. The Zionist lobby group “Campaign Against Anti-Semitism” had brought a legal action to force the Crown Prosecution Service to bring charges against Mr Turner, even though the CPS had originally decided he committed no offence. An initial hearing will be held at 1.30 pm on Monday 30th October at Westminster Magistrates Court, Marylebone. 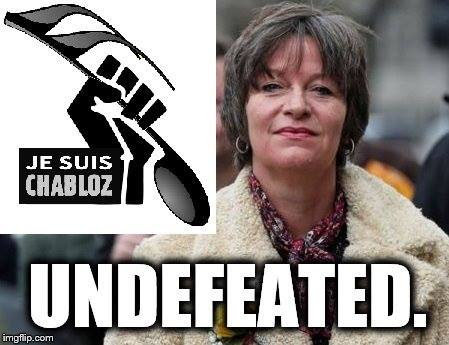 Meanwhile another prosecution instigated by the CAA sees anti-Zionist folk singer Alison Chabloz facing charges under the Communications Act, relating to songs uploaded to YouTube. A full day’s hearing of this case will take place at the same Marylebone court on October 25th at 10 am. Ms Chabloz was arrested again last Wednesday and subjected to an extraordinary 48 hours of custody including travel from London to Derbyshire, following alleged breach of bail conditions. While we are restricted in reporting these cases at the present stage of proceedings, there will be full updates in forthcoming editions of H&D. Spirited greetings to all after 48 hours detention including four arrests, one de-arrest, six hours’ custody at Charing Cross (Desk Sergent: Alison, you’re definitely not the usual kind of customer we get in here). Bundled into police van, filthy, freezing cold, no seat belt, no seat! Three hours of hell to Chesterfield then car to Buxton. Finally charged at eleventh hour for causing yet more musical gross offence to delicate flowers desperate to see me detained on remand for alleged breach of bail. Court hearing in Chesterfield this morn. Great lawyer. Not guilty plea. New charges transferred back down to Westminster Mags for legal argument hearing October 25th. No change to bail conditions. Loveliest court guard was as happy as me: You’re saying everything that everyone thinks but daren’t say out loud. I made it quite plain in my interview that if the authorities wish to lock up a politically incorrect singer, then they can go ahead. In our minority occupied states, the price of principled dissent is public vilification and career ruination if the Zionist thought control freaks have anything to say about it. This is the latest in the Alison Chabloz case from Britain. On or about 08/06/2016 at within jurisdiction of the Central Criminal Court caused to be sent by means of a public electronic network communications network, namely, a YouTube video under the title “(((Survivors)))”, that was grossly offensive or of an indecent, obscene or menacing character. Contrary to section 127(1)(b) and (3) of the Communications Act 2003. At this point, I think it is important to stress that out of the three women who reported me to police for alleged harassment and inciting racial hatred, only one is Jewish. During my interrogation which lasted about an hour and half (I was detained in police custody for six hours in total, including more than two hours locked in a cell), the policeman didn’t even mention the Jewish woman, nor did he read her statement – no doubt supplied on the orders of ‘Amanda from Finchley‘. Ironically, I was arrested by the same police force which, two years ago, had worded a cease and desist letter, sent by recorded-delivery and signed for by the very same ‘Amanda’, who – along with my other non-Jewish accuser – takes equal first prize in the 2016 Professional Victimisation Championships. As for the Jewish woman, I have hardly interacted with her at all. Only once to offer her my phone number or a chat via Messenger, which she refused, preferring to troll me on a daily basis rather than have a face-to-face discussion between adults. Indeed, the poor victim is still actively doing everything she can to please her pay-mistress, despite my account being suspended from Twitter. As well, my critics will be no doubt be unhappy about an email of support from a Russian-French philosopher, Anatoly Livry – also of Jewish heritage. Dr. Livry has given me permission to reproduce his kind words on this blog, translated into English. I would like to send you a word of support: indeed, although being of Jewish origin I do not feel ‘assaulted’ by your songs in English, which I find both funny and witty. On the other hand, as a philosopher, I feel that the ever-increasing ‘shoah hysteria’ is ignoble – a weapon used by my former Jewish co-religionists to annihilate the Indo-European peoples of the West. I agree wholeheartedly with Dr. Livry regards this ‘shoah hysteria’. After Charlie Hebdo, trying to remove my right to artistic freedom of expression is far more offensive that any satirical song. If you are in London next Thursday, I would greatly appreciate your support. The hearing begins at 10am.